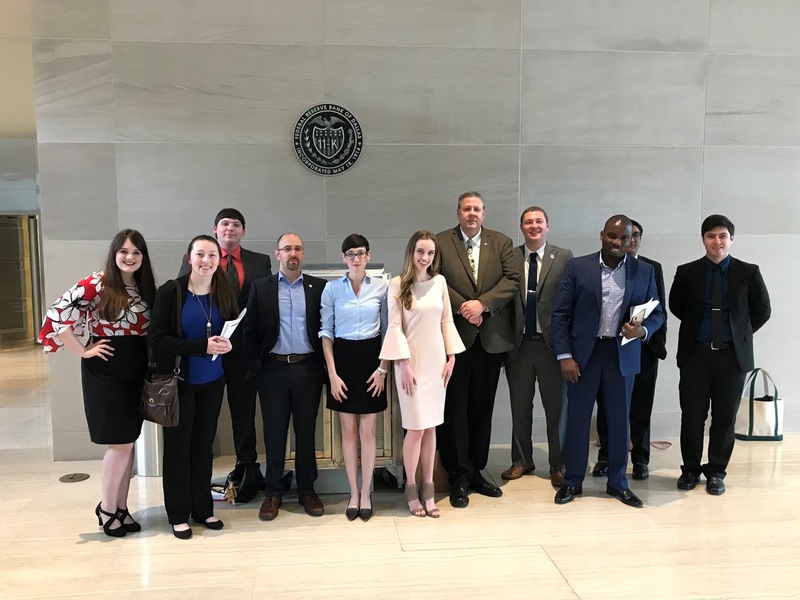 DALLAS, Texas — Nine Louisiana Tech University College of Business students recently attended the 12th annual undergraduate research conference for the Economic Scholars Program (ESP) at the Federal Reserve Bank of Dallas. With more than 90 submissions from over 20 universities, seven College of Business students were selected as presenters, poster session presenters, and discussants. Students developed their research as part of the ECON 451 “Research Methods for Economics” course taught over the winter quarter by Assistant Professor of Economics Dr. Patrick Scott. Research topics in the course ranged from state-level minimum wage policies and the election outcomes on consumer confidence, to Bitcoin price volatility and the effect of cigarette taxes on smoking consumption. Senior finance major Kishan Desai of Arcadia enjoyed the networking opportunities afforded to him through attending the conference. He was selected to present his research, “Analyzing Bitcoin Price Volatility,” in the poster session. Other College of Business participants included senior finance major John Soileau of Gonzales (discussant), senior finance major Sydney Womack of Jackson (discussant and poster presenter), recent finance graduate Blake Beauregard of Rowlett, Texas (poster presenter), and recent finance graduate Taylor McCoy, of Ruston (poster presenter). The conference offers students the opportunity to share and gain feedback on high-quality undergraduate research. It is also designed to inspire other students to undertake their own projects. Since 2007, student scholars and faculty from institutions across the U.S. and Canada have come together to share undergraduate student-initiated or student–faculty coauthored works, ideas about the role of undergraduate research in the curriculum, and the challenges and concerns of undergraduates who conduct research. “The ESP conference is a great opportunity for our students to present their research, practice their public speaking skills, interact with majors from schools all over the country, and develop the critical thinking skills that make economics majors some of the most sought after undergrads in the College of Business,” Scott said. “I have nothing but good things to say about our students during their time at the Dallas Federal Reserve Bank. For more information on the Economics Scholars Program, visit dallasfed.org/outreach.